Under Suspicion At The Mall Of America Since Sept. 11, the nation's leaders have warned that government can't protect the country on its own — private businesses and civilians have to do their part, too. Now NPR and the Center for Investigative Reporting have found that, at least in one community, these kinds of programs are entangling ordinary people with the police and FBI. Since Sept. 11, the nation's leaders have warned that government agencies like the CIA and the FBI can't protect the country on their own — private businesses and ordinary citizens have to look out for terrorists, too. So the Obama administration has been promoting programs like "See Something, Say Something" and the "Nationwide Suspicious Activity Reporting Initiative." Under programs like these, public attractions such as sports stadiums, amusement parks and shopping malls report suspicious activities to law enforcement agencies. But an investigation by NPR and the Center for Investigative Reporting suggests that at one of the nation's largest shopping malls, these kinds of programs are disrupting innocent people's lives. One afternoon three years ago, Francis Van Asten drove to the Mall of America, near Minneapolis, and started recording. First he filmed driving to the mall. Then he filmed a plane landing at the nearby airport, and then he strolled inside the mall and kept recording as he walked. He says he was taking a video to send to his fiancee in Vietnam. As he started filming, he didn't realize that he was about to get caught up in America's war on terrorism — the mall had formed its own private counterterrorism unit in 2005. And now, a security guard had been tailing Van Asten since before he entered the mall. Van Asten was first approached by a guard outside a clothing store. "And he asked me what I was doing. And I said, 'Oh, I'm making a video.' And I said, 'Are we allowed to make videos in Mall of America, and take pictures and stuff?' He says, 'Oh sure, nothing wrong with that,' " explains Van Asten. "So I turn to start walking away, and then he started asking me questions. Why am I making a video, what am I making a video of, what I did for a living, and he asked me, what's my hobbies?" The guard called another member of the mall's security unit, and they questioned Van Asten for almost an hour before summoning two police officers from the Bloomington Police Department. "I hadn't done anything wrong. I wasn't doing anything wrong, according to them even. I asked the policeman why I was being detained," says Van Asten. "He said, 'Listen, mister, we can do this any way you want: the easy way or the hard way.' "
And then, the police took Van Asten down to a police substation in the mall's basement. The Department of Homeland Security has been using public service announcements to ask Americans and private businesses to stay vigilant. 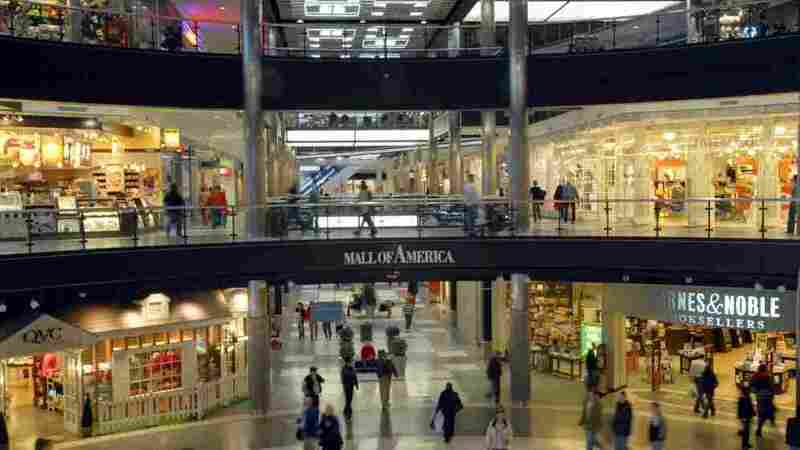 "I think our name first of all, Mall of America, is attractive to people that want to hurt America," says Maureen Bausch, vice president of the Mall of America. She says at least 100,000 people visit the mall on a typical day. Maureen Bausch, a vice president of Mall of America, says their program was put in place to keep visitors safe. "We are definitely the No. 1 attraction in Minnesota, one of the biggest attractions in the United States," she says. "So the government officials have asked us always, since 9/11, to be on the watch." The mall calls its counterterrorism unit RAM, or Risk Assessment and Mitigation. The unit is staffed with private security personnel. Bausch wouldn't say in detail how this unit identifies people like Van Asten as potential terrorists, but documents obtained by NPR and the Center for Investigative Reporting provide some insight. NPR and CIR asked 29 law enforcement agencies across the country to give us suspicious activity reports from attractions in their areas – everything from amusement parks to baseball stadiums. We asked under state versions of the Freedom of Information Act. The only officials who responded were in Minnesota: They sent us 125 reports that involved suspicious activities at the Mall of America. One of those reports that the Mall sent to local police is on Francis Van Asten. According to the 18-page report on Van Asten, the mall's RAM unit thought he was "very suspicious" because he kept filming as he walked. He didn't start and stop like most people do. Van Asten says that's true. He wanted to convey the experience of going to the mall. The counterterrorism unit thought he might be mapping an attack. The report tells how the Bloomington police officers took Van Asten to a police substation in the basement in the Mall of America after mall security questioned him. They frisked him. They seized his camera. They detained him in that room for one more hour. The police called the Joint Terrorism Task Force. And an FBI agent told them: Seize the memory card in Van Asten's camera and delete all his videos. After two hours they let him go. Van Asten says he loves this country. Back when he was in the Army, he worked at a nuclear missile site. But he says that afternoon at the Mall of America shook him. "When I was finally released, I couldn't find my way to my own car for over a half-hour. I sat down in my car and I cried and I was shaking like a leaf." The documents from the Mall of America suggest that sometimes, the RAM unit gets suspicious about things you'd probably notice, too — like a pair of unattended suitcases. But much of the time the security guards report people for seemingly ordinary behavior. Mall security reported one man because he was sitting on a bench in the corridor, "observing others while writing things down on a note pad." They worried he might be a terrorist "conducting surveillance." Turned out he was a musician waiting for a friend. Three security guards surrounded another man because they thought he was looking at them "oddly" and walking "nervously" through the amusement park; he turned out to be an insurance company manager, shopping for a watch for his son. "I'm not real sure I'd go to the mall. I mean they might accuse me of being a terrorist," says Dale Watson, who used to run the counterterrorism program at the FBI. After reading some of Mall of America's suspicious activity reports he pushed them away. "I mean, if somebody's in buying ammonia nitrate out in Pennsylvania in a rural place, in a rental truck, you know, and the owner's never seen them before, putting in plastic barrels, I'd say yeah, that's a suspicious activity, they should be reported," he says. "The value of what I've seen here is absolutely not worth the effort." Yet look what happened when Najam Qureshi's father came under suspicion at the Mall of America. Najam Qureshi was born in Pakistan, but he's been a U.S. citizen since he was a teenager. Today, he manages computer systems for a major company near Minneapolis. He and his family live on a pretty suburban street. Najam Qureshi's father came under suspicion at the Mall of America after leaving his cellphone in the food court. In January 2007, an FBI agent showed up on his doorstep. It turned out that a few weeks before, Qureshi's father had left his cellphone on a table in the Mall of America's food court. When the mall's counterterrorism unit saw the unattended phone, plus someone else's cooler and stroller, guards cordoned off the area. Qureshi's father wandered back, looking for his phone, and the RAM unit interrogated him and then reported him to the Bloomington police. In turn, the police reported the incident to the FBI. The documents we obtained show that the mall's reports went to state and federal law enforcement, in roughly half the cases. The incident with Qureshi's father led the FBI to want to question Qureshi himself, in his own home. "He asked me if I knew anybody in Afghanistan. And that was kind of like, what?! And, then he asked me if I had any friends in Pakistan," Qureshi says. "My reaction in my mind, was, 'How dare this guy in my house, come in and say this,' " he recalls. But mall officials stand by their program of identifying suspicious people. "You're talking about a handful of people that are complaining, out of the 750 million plus that have been through these doors since 1992," Bausch says. "And we apologize if it, you know, if it caused them any inconvenience, I mean we really do." "Unfortunately the world has changed," says Bausch. "We assume you'd want your family and friends to be safe if they are in the building. And we simply noticed something that we didn't think was right." A commander with the Bloomington police said these reports would be kept on file for decades. When Qureshi found out that the 11-page report reading "suspicious person" would be kept that long, his eyes filled with tears. "It shattered an image of the U.S. that I had, fundamentally. I don't know, especially when I saw some of these reports. It's definitely bothersome, how small things can just, you know, trickle up that quickly, and all of a sudden you're labeled. And once you're labeled, you're basically messed up, right?" Do Suspicious Activity Reports Keep Us Safer? John Cohen, who helps run the counterterrorism programs at the Department of Homeland Security, says the suspicious activity reports have already made America safer. "One recent example is the case of Faisal Shahzad, the Times Square bomber. Where a suspicious activity report ... helped lead to the identification of the individual who tried to commit the Times Square bombing," Cohen says. Other counterterrorism specialists discount that example, since the report did not help prevent an attack: It was luck that the car bomb didn't explode. Juliette Kayyem, a former counterterrorism adviser to the governor of Massachusetts and an assistant secretary at the Homeland Security Department until last year, says she doesn't know of any cases in which suspicious activity reporting led to the apprehension of a terrorist. "From these reports [from the Mall of America], these are security officials who appear to be simply approaching people for very innocuous-seeming behavior," she says. "There's not a huge amount of quality control." Watson, the former FBI counterterrorism chief, says he believes people have been "in a rush to get involved in the war on terrorism." "I see a pattern here where American citizens are being suspected of something without any of the legal standards," Watson says. "If that'd been one of my brothers that was stopped in a mall, I'd be furious about it, if I thought the police department had a file on him, an information file, about his activities in the mall, without any reasonable suspicion to investigate." Over the decades, court decisions have spelled out detailed rules: When can a policeman stop you? Search you? When can the police detain you? Watson says those reports from the Mall of America suggest that suspicious activity reporting programs could push the country in the wrong direction. "To heck with the Bill of Rights and the Constitution. Let's just stop all of this stuff. OK. So, if I'm driving down the street and I'm a police officer, if I want to stop you, I'll just stop you. Or if I see you wearing a red coat, maybe I'll think you're a Communist, in the old Communist days. So I'll take you to jail and hold you for 24 hours. That is not what we are," he says.